Hands-free offsite backup of your company’s database; encrypted data transfer for maximum security. 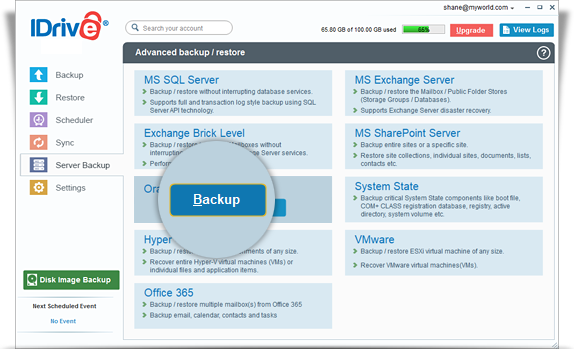 The Oracle server backup feature allows you to backup your Oracle server databases to your IDrive account, without interrupting the running Oracle server services. 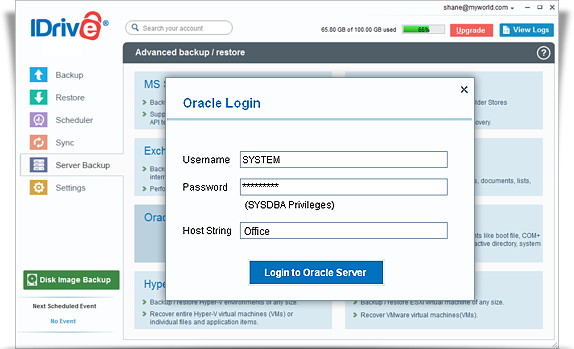 Authentication of the Oracle server database for backup. Provision to backup Oracle server databases without interrupting the running Oracle server services. Provision to report the progress of backup jobs. 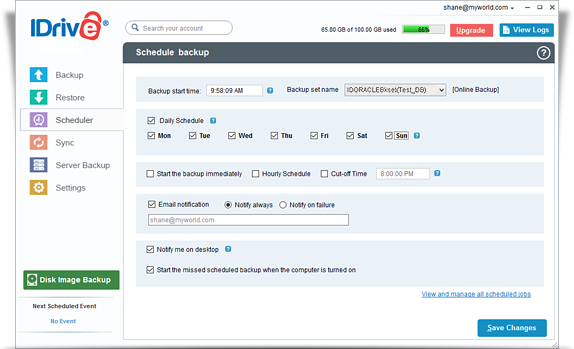 Ability to schedule backups for a future date and time with various scheduling options. Provision to avail notifications (Email and Desktop) upon completion of scheduled backup jobs. Provision to generate log files for each backup session. 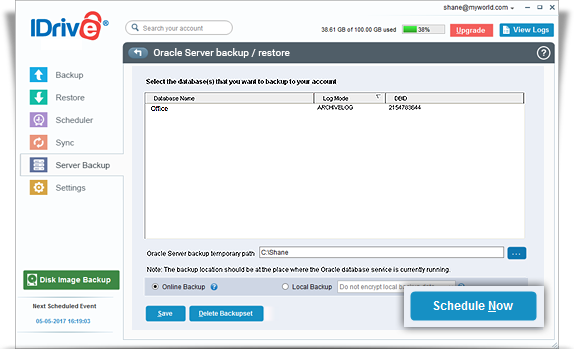 Under Oracle Server section, click 'Backup'. Provide the Oracle Server authentication information when prompted. Select the database(s) from the list which appears and specify the local backup location. Note: Ensure that the selected temporary directory on the local computer has sufficient disk space to hold the Oracle server backup resources. Also, select the temporary location on the computer where the Oracle server service is running. If you are performing a remote/network Oracle server backup, then select the temporary location on the server where the Oracle server service is running. Note: For easy identification of the Oracle server backup set, the name of the backup set will begin with 'IDOracleServerBkset' followed by the Database SID (Database System Identifier) name that you have scheduled for backup. For example: If the Database SID name is 'JOHN,' then the name of the backup job would be 'IDOracleServerBkset (JOHN_DB)'. You can consult your Oracle DBA for details on the configuration parameters. View the steps to restore the Oracle Server.